For the Nintendo DS version, see The Sims 2: Castaway (Nintendo DS). For the Windows game, see The Sims: Castaway Stories. 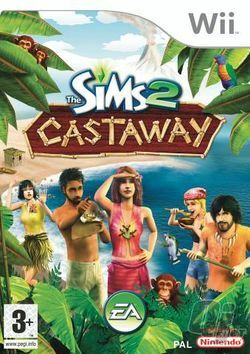 The Sims 2: Castaway is the third console spin-off of The Sims 2. It was released in the US on October 22, 2007 and October 26, 2007 in the UK for the PlayStation 2, PlayStation Portable and Wii. A different version was released for the Nintendo DS. The game takes place with the player creating his/her sims to travel on a yacht. When the game starts a slideshow of cell-phone pictures are shown of the trip and of the storm that wrecks the ship. The player's starting sim will wake up on Shipwreck Island confused as to where he/she is. To keep the sims sane, the player is set out a series of goals from different books the player can find on different parts of the island and the other three islands. The player's last goal is to send an SOS or build a sea worthy boat and get rescued by a cruise ship. At the end of the game the player is shown a second picture slideshow (this one not on a phone) of one of the sims's life back in civilization. The sim does not look happy with all the bills that have piled up. Now the player has chance to finish the game or continue island life. This page was last edited on 13 March 2012, at 04:12.